Any particular settings changes to pay attention to? I am going to try it out using S3D on a new printer I build from scratch, a Zaribo. I have not run the new printer using Slic3r PE yet but other than setting the extruder steps in the slcier it should be the same as my MK2. This is the first time I have ever been draw to comment on any print , I printed this as a test print, I was very surprised this is awesome. Can it really swim with the standard size? I scaled it up to 210% and it can't swim, it tips over. Great looking model nonetheless. Yes, actually, swims very well. Why it doesn't do that in bigger, I don't know either. Unfortunately I can't help there, because I have no experience with Flex myself. The multi-colour model looks really great. Unfortunately the overlapping parts have been causing problems slicing in Simplify3D or Slic3r. What slicer did you usewhen you made it? Unfortunately I only have experience with Slic3r because I can only use this for the Prusa MMU. I didn't really have any problem with that. Very COOL print! Added to my Benchy Collection. Hope to see more designs in the future. Printed it full size and it turned out great! Cool design! I made it and it is pretty awesome, just like the previous one. However, I think that one might want to consider adding some more infill to the bottom if they want it to float in the bath (the previous one printed with 15% infill floats like a charm and this one turns bottom up). Nevertheless, the design is veeeery pretty and we (my kids and I) love it. Thank you very much for sharing and I will be looking forward to seeing some more of your designs. Very nice! Do you mind if I ask, what software are you using for your designs? 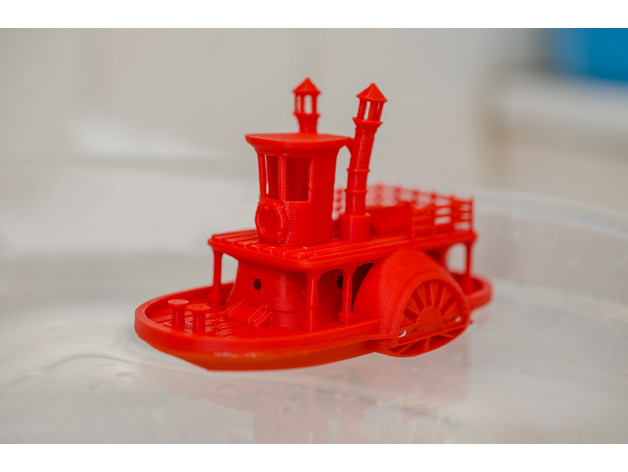 Old paddle-wheel steam boat with display stand (visual benchy) by vandragon_de is licensed under the Creative Commons - Attribution - Non-Commercial - Share Alike license.